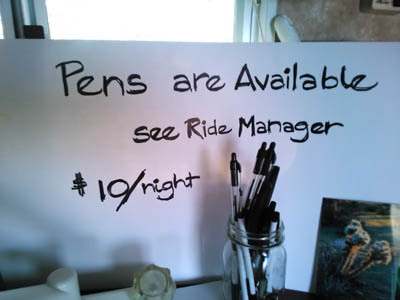 Not too many ‘Green Bean’ Ride Managers have jumped head-first into managing an established 2-day endurance ride, where everybody already has a certain level of expectations. But then, most people aren’t Gretchen Montgomery. A long-time endurance rider based in the Pacific South region with over 8400 miles, and newly-minted Decade Team with her horse Definetly Spice (formerly known somewhat affectionately as “Bitchy Spice”), the effervescent, personable high achiever is not one to turn away from a challenge. Gretchen's many years of volunteering at the Eastern High Sierra Classic, Fire Mountain, Washoe, and Virginia City 100 rides, alternately as trail marker, vet secretary, finish line timer, and pulse-taker, built the foundation and confidence for stepping up into her new role as Ride Manager. "I’ve really wanted to take over the Eastern High Sierra Classic (in Bridgeport, California, in late summer) because that’s my home territory, and Jackie (Bumgardner) is ready to pass it on after 29 years, and I wanted that ride to continue," Gretchen explains. "And in the meantime, the Fire Mountain Ride Manager (Valerie Rogers) wanted to give the Fire Mountain ride up, but that’s been a long-standing ride too. 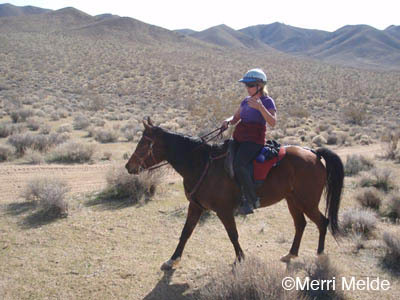 So since they needed a Ride Manager this year, I volunteered.” The Fire Mountain ride takes place outside of Ridgecrest, California, in the Mojave Desert, where Gretchen spends her winters. Recently retired from 25 years with the state of California, Gretchen’s previous job of Office Services Supervisor for the California Highway Patrol in Bridgeport brought her organizational skills into play as she was kept uber-busy with last minute on-line entries to avoid late fees, last minute entries at the ride venue (where no internet was available), checking AERC registrations, keeping track of 114 riders over 2 distances and 2 days, making changes for riders wanting to switch horses, or switch distances, or switch horses and distances, running back and forth to fill in as a vet secretary, checking on the in- and out-timers, helping with P & R’s, doing general maintenance, helping the ham radio volunteers to find an injured horse on trail, and playing the banjo. Playing the banjo? … “I was a little crazy!” Gretchen laughs. 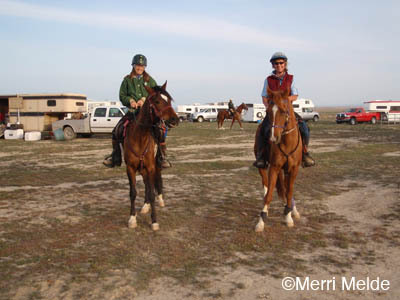 Managing the ride was made easier by excellent and numerous volunteers, particularly the Valley Riders club, a group of varied horse people from the area established in the 1960's. "This particular ride has soooo many volunteers, and I didn’t have to worry about the trail being marked, because there was already somebody in charge of that. I didn’t have to worry about setting out water, because somebody was already in charge of that. I didn’t even have to worry about the food, because one of the members of Valley Riders was all about cooking, and our facility has an actual kitchen right here at basecamp. So this was really good for my first time managing a ride - since this was the 36th year, people know what they're doing." Such a busy event progresses smoothly by not only having great volunteers, but by surrounding yourself with good staff. Head veterinarian Melissa Ribley helped keep both days of the ride running efficiently. 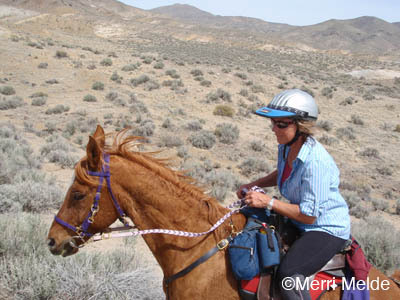 Melissa knows her way around endurance trails, with over 20,000 AERC miles, 11 Tevis Cup finishes, and a Haggin Cup win. She complimented Gretchen’s efforts: “I have worked for many different ride managers as head vet, and Gretchen has been one of the best ride managers to work with. She was very enthusiastic and quite organized. "She took time each afternoon to treat us to some fun music by playing her banjo. The weather was perfect - sunny and warm during the day, so she would sit outside in her lawn chair each afternoon of the ride for a bit and strum away on her banjo - quite nice for the rest of us." The only thing Gretchen didn't have control of is the weather, and the Fire Mountain ride is often known for the "W" word - the Wind which often particularly picks ride weekend to present itself with rather great force. "The weather was perfect, the trails were great," Gretchen says. "We had gotten a lot of rain on the Sunday before, so the trails were in really good shape. Mornings were beautiful, the sunrise… Ah! it was nice!" 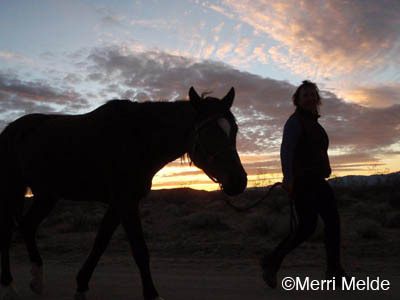 Veteran endurance rider Nick Warhol (11,000 miles, 5-time Tevis finisher), who finished the 50-miler on Saturday, where he reached Decade Team status with his beloved Forever Dawn, said, "Gretchen did a great job. She worked very hard, and the ride went off perfectly as far as I can tell. The trail was excellent, marked better than it needed to be, plenty of water, great vets, great camp with everything you need, good food, it went very well. The best thing about her is she is always smiling and happy, no matter what." Seasoned endurance rider Lisa Schneider (10,000 miles, 5-time Tevis finisher), who rode a 50 on the first day, also chimed in, "Congratulations to Ride Manager Gretchen Montgomery and her management team from Valley Riders at the Fire Mountain ride last weekend! The trail markings were perfect, the weather couldn't have been better with temps in the 60s and the vets and volunteers were the best! At one water stop, the volunteer greeted us with a cheery 'Welcome to Mike's oasis' and had hay and carrots for our horses." When the endurance ride is over, the work doesn't stop, however. Tuesday found Gretchen wrestling with calculating BLM fees and drug fees, and consolidating and sorting out the 2-day results for AERC. "I know it’s probably easy once I get it figured out, but…" - but she decided to take a break, and instead go clean up at the ride venue and ride her horse. "The overall thing I can say as a Ride Manager is that you walk a lot of mileage. You’re constantly walking. Walk to do this, walk to do that. Or maybe it’s just my nature. I've got to make sure everybody is running smoothly, if they've got any questions; or if something’s not going smoothly, let me know so I can fix it. "The other thing I can say, is that your head hurts, and your feet hurt. It was definitely crazy. My brain is still a little bit fried!" It's all worth it in the end, and with the experience gained at Fire Mountain, endurance riders can look forward to being greeted again by Ride Manager Gretchen's smiling and happy face in August's Eastern High Sierra Classic.